Carbon, even in its elemental form, has a high bond versatility that allows for a variety of common materials, including graphite and diamond. Graphene, otherwise known as a layer of graphite, can be folded or rolled into fullerenes or carbon nanotubes, respectively. Until recently, both fullerenes (1996) and graphene (2010) have been awarded with Nobel prizes. Carbyne is an infinitely lengthy carbon chain. Scientists are still not able to synthesize this material, which was presented by Adolf von Baeyer in 1885. Adolf von Baeyer is a Nobel laureate who was recognized for his contributions in organic chemistry in the year 1905. Von Baeyer pointed out that carbine will continue to exist as an elusive material, because its high reactivity would inevitably lead to its instant destruction. Over the last 50 years extremely long carbon chains have been synthesized, touching a record of about 100 carbon atoms in 2003. This record is now broken by an increasing order of magnitude, along with a presentation of micrometer length-scale chains. Thomas Pichler and a team of researchers from the University of Vienna have introduced a unique technique that will help the growth and stabilization of carbon chains comprising a record length of 6,000 carbon atoms, enhancing the previous record by more than one order of magnitude. The limited space in a double-walled carbon nanotube was used as a nano-reactor by the researchers in order to grow extremely long carbon chains on a huge scale. The groups of Lukas Novotny at the ETH Zürich in Switzerland, Kazu Suenaga at the AIST Tsukuba in Japan, UPV/EHU San Sebastian in Spain, and Angel Rubio at the MPI Hamburg in Germany have together confirmed the existence of carbon chains, using a number of complementary and advanced techniques. These include temperature dependent near- and far-field Raman spectroscopy with a variety of lasers (to analyze vibrational and electronic properties), x-ray scattering (to ensure bulk chain growth), and high resolution transmission electron spectroscopy (to directly observe the existence of carbine in the carbon nanotubes). This study was recently published in Nature Materials. The direct experimental proof of confined ultra-long linear carbon chains, which are more than an order of magnitude longer than the longest proven chains so far, can be seen as a promising step towards the final goal of unraveling the "holy grail" of carbon allotropes, carbyne. 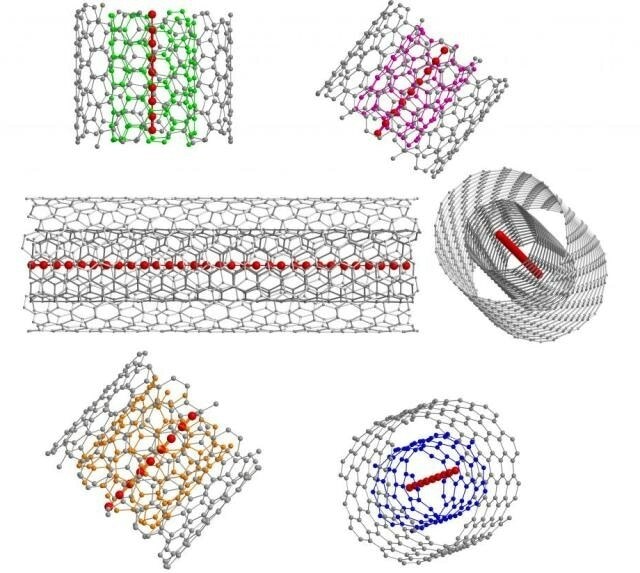 Carbyne is present in a stable form within the double-walled carbon nanotubes. This property is of immense significance when carbine is used in future devices and materials. Based on theoretical models, it has been discovered that the mechanical properties of carbine surpasses all popular materials, performing better than diamond and graphene. The electrical properties of carbine suggest unique nanoelectronic applications in magnetic semiconductors and quantum spin transport.